The Croatian Labor Code was significantly reformed in 2003 as a result of extensive negotiations lasting about two years. Proponents of the reform emphasized the supposed rigidity of the labor market, resulting from restrictive employment protection legislation, as a main rationale for the reform. Critics believed that the labor market is much more flexible than often thought due to inadequate enforcement of legislation. This study aims to assess the level of labor market dynamics by constructing disaggregated indicators of job and worker flows, according to different types of enterprises and workers. 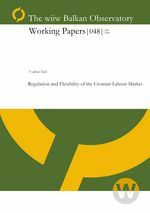 Job and worker flows reveal that the overall degree of flexibility is not below that observed in other transition countries as employers learned to increasingly use flexible contracts. However, the findings confirm a strong dualism in the Croatian labor market. While labor market regulation did not significantly inhibit flexibility in the new private sector, it seems that regulation may have slowed down the process of restructuring and shedding labor in the state and newly privatized sectors. Also, as employers in the de novo private sector increasingly relied on short-term temporary contracts, it seems that incentives for engaging informal labor diminished. Therefore, the reform of regulation is likely to foster employment restructuring in state and newly privatized sectors, but cannot be expected to facilitate more flexibility in the de novo private sector.